Credit Suisse predicts a coalition government with the Pakistan Tehreek-e-Insaf to edge ahead of main rival Pakistan Muslim League-Nawaz in the July 25 polls. The Zurich-based global financial services and equity research company assessed the possible electoral outcomes and their implications on the economy. It predicts three scenarios whereby no single party will attain a majority, or get past the magic number of 100 National Assembly seats. According to Credit Suisse, the most likely scenario is a PTI-led coalition with a 60% probability. Under this scenario, which offers the strongest possible government formation, PTI will win 92 National Assembly seats out of the total 272, Credit Suisse says. However, it will need support from the MQM, PSP and independent candidates to have more than 50% seats. In this case, the capital market will gain up to 10% after the elections. Given PTI’s strong emphasis on the agriculture sector, fertiliser companies are likely to benefit in the form of subsidies on urea and incentives for farmers on capital equipment purchases. The banking sector will also benefit with the PTI pushing for agri-credit and housing finance as per their manifesto. The coalition will make efforts to stimulate exports and reduce electricity costs, benefiting energy and textile companies. 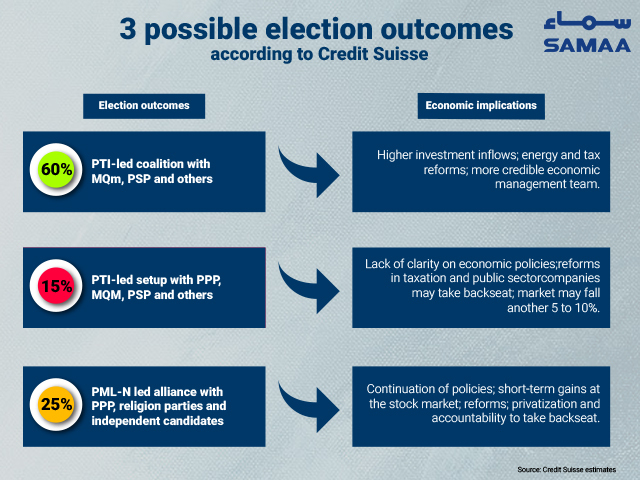 In the second scenario, which Credit Suisse says has a 15% probability, the PTI will form a coalition with the PPP along with regional parties and independent candidates. This would take the PTI’s representation in the lower house past 60% but have negative implications for the market because of lack of clarity on economic policies and sustainability of the arrangement for a full term. Since both the PTI and PPP have policies favouring agriculture, fertiliser stocks will gain from this coalition but it would mean concessions for the PPP in the areas of accountability and restructuring of government-owned companies likes PIA and the Pakistan Steel Mill. Though it puts the PTI ahead, Credit Suisse doesn’t rule out a PML-N-led coalition with the PPP. In this scenario, the PML-N’s policy will continue but the weaker mandate of the ruling party would result in more concessions to the PPP and other coalition partners. This will affect tax reforms and restructuring or privatisation of public sector companies like the Pakistan Steel Mills, PIA, and electricity generation and distribution companies. The accountability process may also take a back seat and the completion of the government’s tenure will remain uncertain. The cement sector will benefit because of infrastructure and housing demand. Banks will rally as business sentiment will stay upbeat and corporate expansions under the CPEC will accelerate. Energy stocks may also see some interest as the government will look to clear out the circular debt. If both the PTI and PML-N secure 70 to 80 seats each, there will be a hung parliament, which Credit Suisse terms the biggest risk to stability. This would mean a lack of consistency in economic policies and a slowdown in reforms. However, a decisive mandate would be cheered by the market, Credit Suisse says and predicts that the benchmark KSE-100 index will reach 47,000 points by the end of the year. The index is currently hovering at 39,909 points.